Accueil du site > Annuaire > BERRET Jean-François. Nanoparticles are objects with at least one characteristic size in the range of 1 – 100 nm. The exposition of human lungs to nanoparticles by various means has raised concerns in public safety, and resulted in increased research to study the impacts on the related physiological functions. Many significant findings have been reported deciphering the effects of different components of lung fluid, which is the first biological environment that nanoparticles encounter when they reach the lungs (Figure 1). Studies on the cytotoxic effects of nanoparticles on lung epithelial cells are also conducted to evaluate their fate in human body, and their possibility of translocation. Our approach is a comprehensive method to study the interaction of nanoparticles with lung fluid, analyzing the new structures that form and evaluate the interaction of these new structures (nanoparticles with a lipidic corona and/or complex aggregates of lipid vesicles and NPs) with lung epithelial cells (Figure 1). Figure 1 : The different scales in the lungs, from the overall organ to the alveolus. 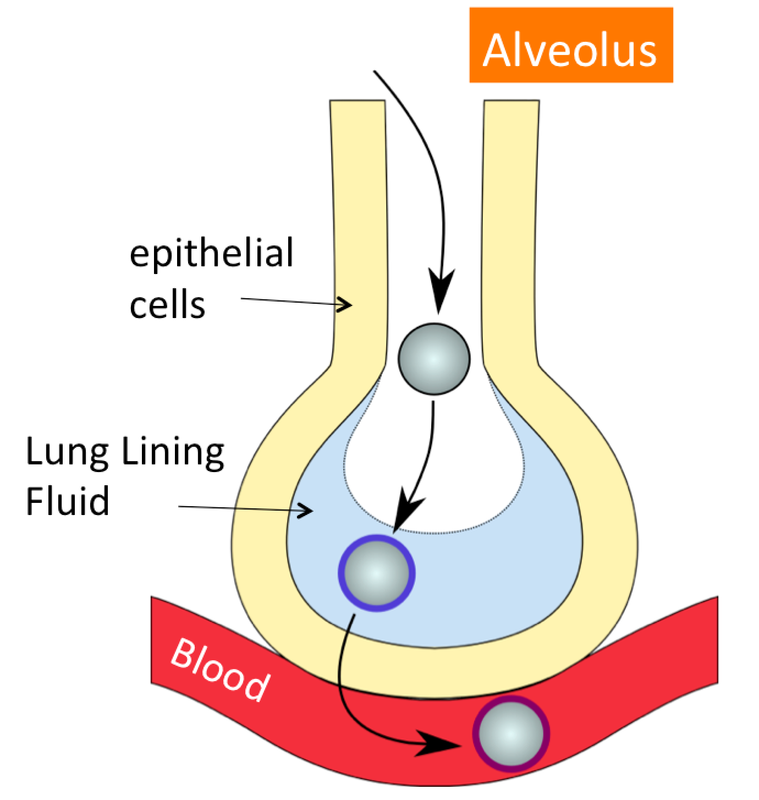 The lung lining fluid is a phospholipid phase that wets the epithelial cells located in the alveolar sacs. In this project, we will study different types of 50 nm nanoparticles (oxides, latexes) in different lung fluid preparations. The aims of the project are : 1) To decipher the properties of nanostructures that form as a result of interaction between nanomaterials and lung fluids. This will be achieved thanks to extensive physico-chemical characterization techniques, such as light scattering, differential sedimentation centrifuge and by electronic and optical microscopy techniques. 2) To study cytotoxicity and internalisation pathways of the particles in lung epithelial cells, using cell biology and microscopy techniques. 3) Develop a model of particle/phospholipid/cell interactions that could be applied for new type of vectors dedicated to lung therapy and treatment. The intern will join a group of 6 researchers, composed of 1 PhD (Fanny Mousseau), 2 postdocs (Leticia Vitorazi, one to be hired) and 3 permanent positions. The permanent positions are an ANR awarded “Chaire d’excellence” (Emek Seyrek), a biology engineer (Carine Vias) and a CNRS scientist (Jean-François Berret). Our research group develops novel functional nanostructures with stimuli-responsive features and biocompatibility. The particles, proteins and other biomacromolecules are elementary bricks of colloidal scaffolds designed for applications. Based on techniques of assembly using non-covalent interactions, this approach offers versatility and simplicity for the fabrication of novel nanomaterials with enhanced functionalities. A second objective of our research deals with the applications of these nanomaterials in medicine, biology and in environment. It includes their use as tools for imaging and therapy in living cells and tissues, as well as the study of their cyto- and genotoxicity. In this research, emphasis is put on key features such as interactions, localization and titration of nanomaterials in biological and natural environments. N. Lewinski, V. Colvin and R. Drezek, Small, 2008, 4, 26-49. M. P. Monopoli, C. Aberg, A. Salvati and K. A. Dawson, Nat. Nanotechnol., 2012, 7, 779-786. R. Landsiedel, L. Ma-Hock, A. Kroll, D. Hahn, J. Schnekenburger, K. Wiench and W. Wohlleben, Adv. Mater., 2010, 22, 2601-2627.